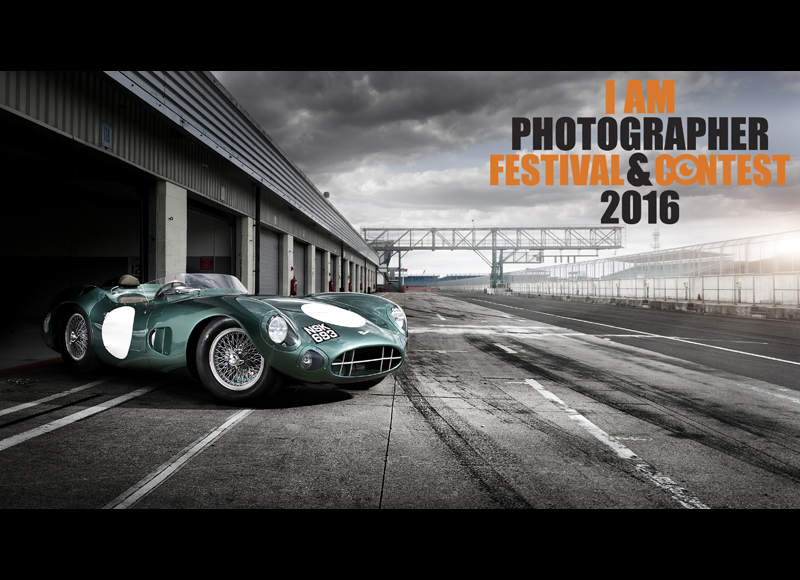 We are pleased to announce that Commercial Car Photographer Tim Wallace will be at the 'I AM PHOTOGRAPHER' Event based in Estonia in April 2016 to give both a seminar class and a live shoot workshop. Tim gives seminars and workshops all across the globe from the US to Dubai but this will be his first time attending this event and we are all really looking forward to what should be a great few days. Platform and Seminar details along with booking information is available on the link above. Described recently as one of the 10 most influential photographers operating professionally today he looks back on his extraordinary journey over the last 7 years that have taken him for the very starting point of his own business 'AmbientLife' to where he is operating today within the commercial industry, the iconic images that Tim has become recognised for and also looking at the decisions that he made along that path to carve out his niche within the car industry. Tim will be talking through some of his work as well as openly discussing how he started from nothing to build up a recognisable style and brand, the mistakes and successes along the journey and his own personal view on what is important to succeed within this very competitive arena today. A very frank an open presentation on what Tim sees as the key factors to success as well as getting into the right frame of mind to succeed in business as a commercial photographer and how today photographers perceive themselves and their work within the client market and perhaps how his own approach and methods differ from the more traditional approaches. A class that is not to missed for all those starting on their own journeys and also for those truly interested in being given the chance to have their opinions opened to a new way of thinking and approaching business. 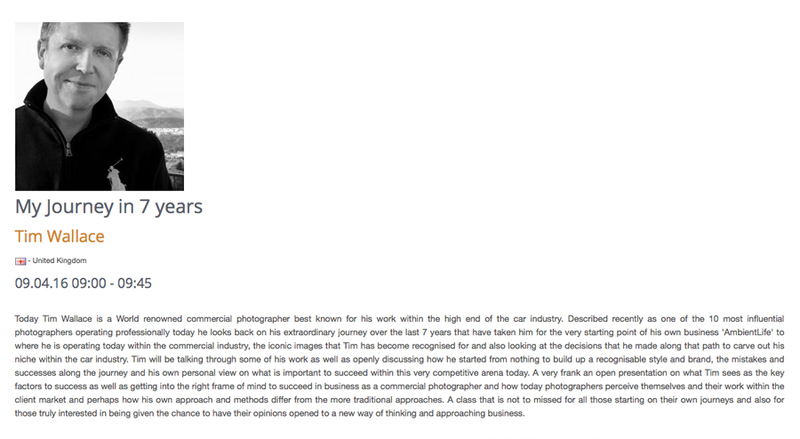 Tim Wallace works internationally as a commercial photographer but is arguably best known for his work within the prestige end of the luxury car industry, shooting for such clients as Aston Martin and Jaguar Land Rover. The work that he produces is both strong in its style and its appearance and Tim's signature work is that with lighting of cars and his ability to create amazing detail shots for his high end clients of their cars for use on billboards, showrooms and brochures. 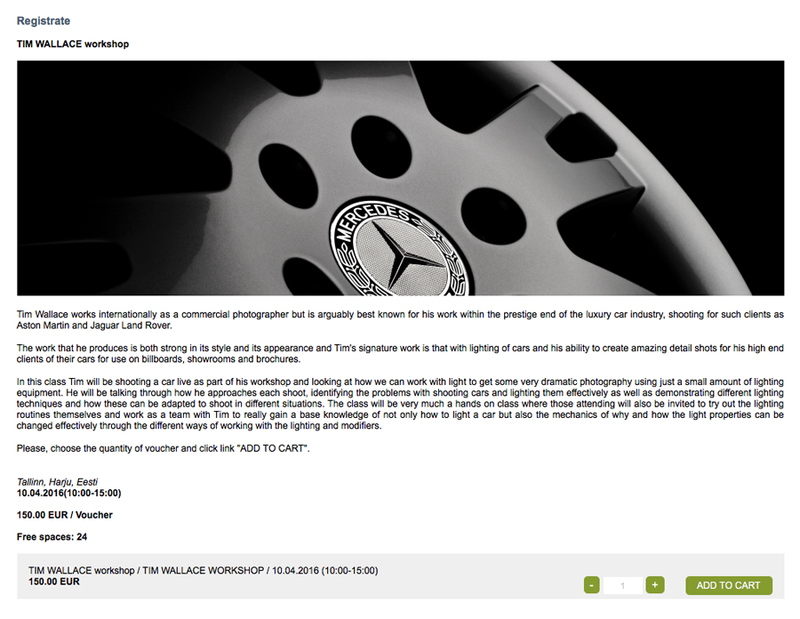 In this class Tim will be shooting a car live as part of his workshop and looking at how we can work with light to get some very dramatic photography using just a small amount of lighting equipment. 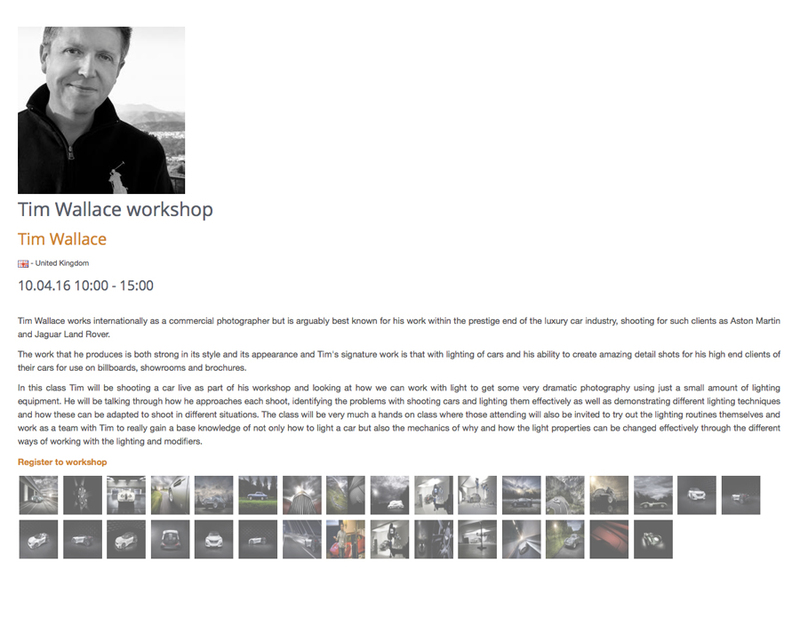 He will be talking through how he approaches each shoot, identifying the problems with shooting cars and lighting them effectively as well as demonstrating different lighting techniques and how these can be adapted to shoot in different situations. The class will be very much a hands on class where those attending will also be invited to try out the lighting routines themselves and work as a team with Tim to really gain a base knowledge of not only how to light a car but also the mechanics of why and how the light properties can be changed effectively through the different ways of working with the lighting and modifiers.